Cap - 1 1/4" x 5/16". Barrel - 1 1/2" x 5/16". colors available on cap, 1 color on barrel. For combination of cap and barrel imprints, maximum 1 color on cap, 1 color on barrel. 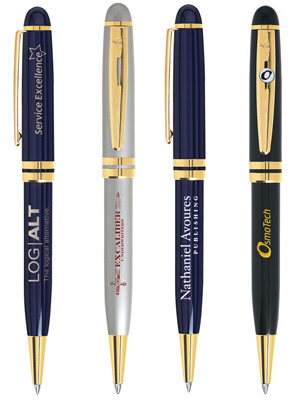 Add $8.25 to your choice of any Esteem pen. Click here. Black, Burgundy, Forest Green, Silver, Navy. All with 23K gold plated clip and trim.